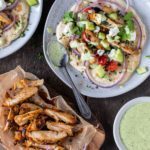 Chicken Shawarma Wraps with home made naan and tzatziki drizzle. Made with lots of fresh and healthy ingredients. So easy and delicious! Add yeast, sugar, and water to bowl of a stand mixer. Stir to activate and let sit for 10 minutes. Add the flour, baking soda, baking powder, oil, milk and yogurt to the bowl. Mix until flour is fully incorporated using the dough hook. Remove dough and knead on a floured surface. Place dough in a slightly greased bowl. Cover and let rise for about an hour. Cut dough into 6-8 equal pieces. Roll into circles. Brush bottom with a little water. Add to a screaming hot skillet (watered side down) coated with coconut oil. Cook until brown on both sides. Place all marinade ingredients in a shallow dish and mix until well blended. Add chicken and marinate in refrigerator over night. Remove chicken from marinade and grill until cooked (about 8-10 minutes per side). If you don’t have a grill, bake at 425 for 20-30 minutes (or until internal temp of 165 degrees). Place chicken on naan bread. Top with tomatoes, feta cheese, cucumber, and red onion. Drizzle with tzatziki and serve. For a great salad option, add the cooked chicken to a bowl of fresh romaine lettuce, tomatoes, red onion, feta cheese, chopped cucumber and top with tzatziki drizzle as a dressing.